The whole world is, to me, very much "alive"
all the little growing things, even the rocks. I can't look at a swell bit of grass and earth, for instance, without feeling the essential life - the things going on - within them. The same goes for a mountain, or a bit of the ocean, or a magnificent piece of old wood. 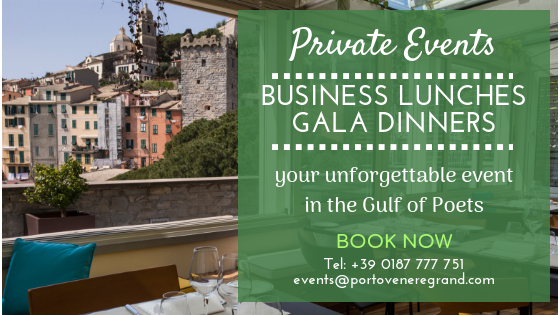 The Palmaria restaurant, the jewel of the Grand Hotel Portovenere, is located in a spectacular veranda overlooking Palmaria Island and the village of Porto Venere. Guests will find themselves inside a contemporary sailing ship that is about to sail towards the horizon. Lunch is served from 12:30 PM to 3:00 PM while dinner is served from 7:30 PM until 10:30 PM. The special Terrazza Lounge menu is served from 3:00 PM to 6:00 PM and from 7:30 PM to 11:00 PM. The sea view terrace and the bar area are the ideal locations for a moment of relaxation with a prime view of the village of Porto Venere and Palmaria island. Moments of true relaxation under the coolness of the ancient vaulted ceilings and on the large terrace, lulled by the rhythm of the waves in the background, the bar service is offered from 11:00 AM to midnight. Concerts on the panoramic terrace. Foodie Nights to enjoy national and international cuisine. taxi boat service on request. *Please note that dogs are not allowed in the restaurant.